What happened? He loved it, and so did the rest of the family. The combination of cauliflower and potato is a good nutritious base to the soup. This healthy, nutritious creamy plant-based, dairy-free, egg-free, nut-free and gluten-free mushroom soup is one recipe I don’t mind making again and again. Since I created this recipe, I’ve already made 3 additional batches (two of the times I doubled the recipe quantity), and my husband even asked me if I could freeze portions of it so he can take it to work. Well we tried it, and you can! Just remember to stir the contents together after it has thawed before reheating on the stovetop or in the microwave. The absolute funniest thing? He remarked to me at the dinner table one evening that he didn’t really like cauliflower (after the children claimed they loved it), and then I told him it was in his beloved cream of mushroom soup! A vegan, plant-based, dairy-free, egg-free, nut-free and gluten-free creamy comforting soup to enjoy on cold winter nights and all year round. Pair with warm crusty bread, whole grain pasta or a gluten-free alternative for a satisfying meal. Heat half a tablespoon of olive oil in a medium sized soup pot over medium heat. Add the garlic pieces first, sauté for 1-2 minutes, then add the finely diced onions. Cook the garlic and onion pieces for about 5 minutes, until the onion pieces are soft and translucent. Add in the remaining half tablespoon of oil and then the chopped mushrooms. Stir and sauté the mushrooms for 5 minutes. Add into the pot the vegetable broth, fortified plant-based milk, sherry wine, ¼ teaspoon thyme and half a teaspoon of salt. Stir to combine well. Let the soup cook for about 5 minutes. Peel the cooked potato and chop it into chunks. 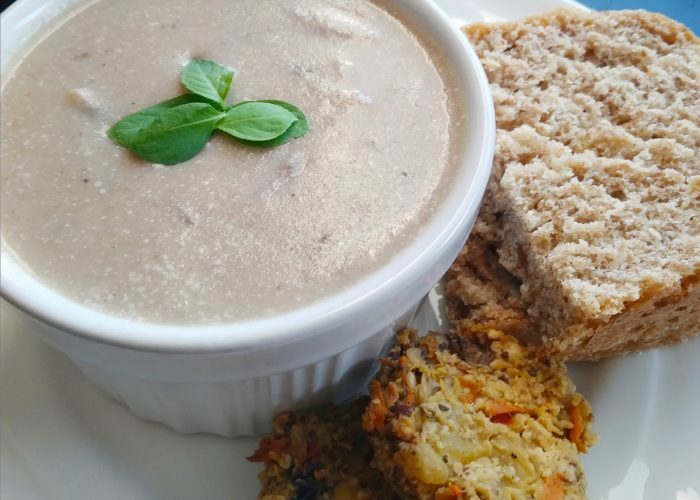 Place the potato chunks, cooked cauliflower chunks, ¾ cup of the mushroom soup from the pot [180 mL], ½ teaspoon of salt, ¼ teaspoon of thyme and ground black pepper into a blender or food processor. Pulse until completely smooth. Add the contents of the blender slowly into the mushroom soup and stir well to incorporate everything together. Add in the two pinches of nutmeg (optional). Taste and adjust seasonings if needed (e.g., add in more ground black pepper, sherry cooking wine or salt if desired). Let the soup continue to cook on a low medium fire (do not let soup boil), stirring occasionally, for at least 15 -20 minutes (or longer if you desire). While the soup is cooking, mix the cornstarch and cold water together in a small bowl. Stir well until fully combined. In the last 10 minutes before the soup is served, stir in the cornstarch and water mixture evenly throughout the soup. Stir continuously for at least 2-3 minutes and then let the soup cook on a low heat setting. Once the soup begins to thicken up, turn off the fire. Serve warm. If the soup appears a little bit on the thin side, don’t worry. As the soup starts to cool down it will thicken up some more on its own. If you have time, you can cook the diced onions down more until caramelized. This will give a richer flavor overall to the mushroom soup. Choose white button mushrooms rather than the brown Cremini mushrooms for a lighter colored soup. If the final color of the soup doesn’t bother you, then you can just use Cremini mushrooms instead. You may roast the cauliflower chunks if you prefer (425 F or 218 C) for 25 minutes instead of steam cooking them. Just rub half to one tablespoon of vegetable oil on the cauliflower chunks before placing them on a baking tray and roasting them in the oven. An alternative method is to cook the cauliflower chunks without oil) in a covered dish (sprinkle some water on top of the cauliflower first) and then microwave them for at least 2-3 minutes or until cooked through. Use any kind of potatoes you like, which can be steamed, boiled or roasted depending on your preference. I have found steaming the potato (along with the cauliflower) to be the easiest and quickest method. However, you could also just microwave the washed potato in a covered dish for 2-3 minutes at a time until cooked through (make sure to poke a few holes with a knife into the potato and sprinkle some water on top first before microwaving). For an oil-free recipe, use about a ¼ cup of vegetable broth (more if needed) instead of the vegetable oil in the heated pot to sauté the garlic, onion and mushroom pieces. Personally, I think this soup tastes the best hot from the pot paired with a salad or sandwich. Or, it could be eaten with some chunks of whole wheat bread (with sections dipped into the soup of course!) or even with fun whole grain pasta shapes mixed into the soup. Pair with an alternative gluten-free bread, pasta or your favorite gluten-free alternative of choice if you desire. You can even use this soup as a base for oven casseroles and other dishes that call for using cream of mushroom soup. Hope you get the chance to try it! Wonderful soup ! Looks so appetizing ! !